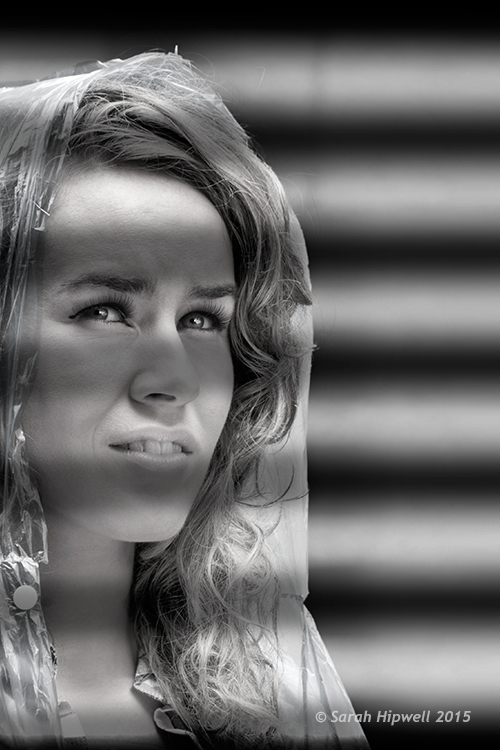 Creating a film noir look with a displacement map in Photoshop. If you are new to Photoshop, the mere mention of displacement maps can be daunting. The purpose of this article is to give you an introduction to them; guide you in easy-to-follow steps on how to generate simple grayscale displacement maps from an existing image, and show you how to effectively implement them using the Displace Filter in Photoshop. How to implement a Displacement Map? Once a displacement map has been generated. You need to use the Displace filter to distort the 2D object, or flat graphic, onto the map. The Displace filter has been in Photoshop since version 2.0. It hasn’t changed much since then, however, it’s still a filter worth getting to know. It may appear to be a convoluted process to use, but when you have tried it a couple of times, it is straightforward. What it does is move the light pixels up and to the left and the dark pixels are moved down and to the right. This creates an illusion of depth through light. This is why your displacement map needs to be quite contrasty. 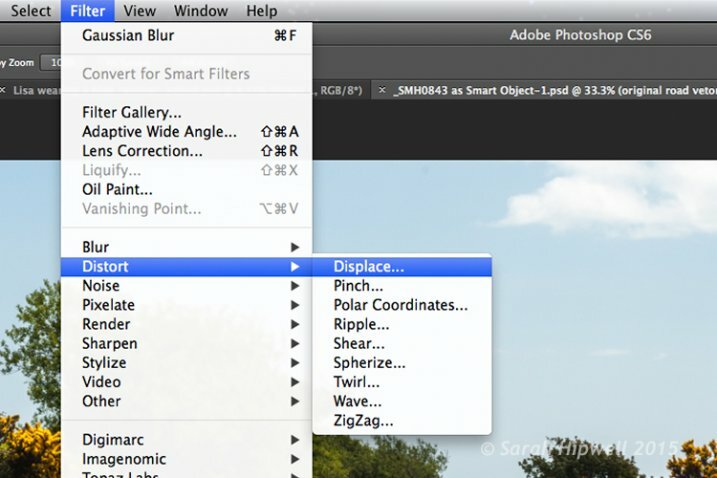 How to access the Distort filter in Photoshop. The first method I describe below shows you how to use a vector shape to create a road marking and map this onto a road surface. This process would be the same for applying logos or text on any textured background. In the other two examples, I describe how displacement maps can be used to create shadow effects. Let’s take a look. 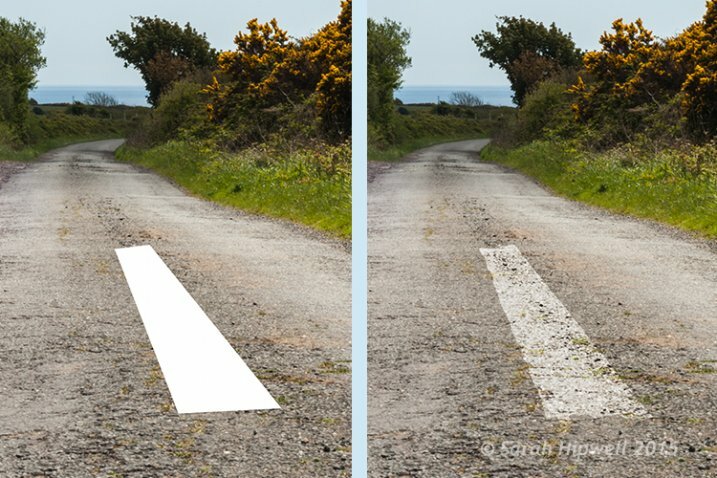 Before and after where the road marking has had a displacement map applied. 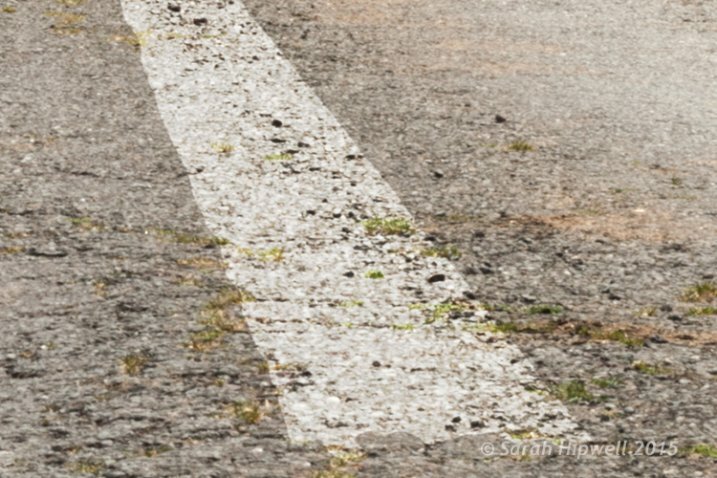 Aim: To create a realistic road marking from a vector graphic. Let’s start with the base image of the road. The displacement grayscale map will be created from this image. The third image is the flat vector image of the road marking. I used the Polygonal Lasso Tool to draw a shape similar to a road marking and filled it with white. Convert this to a Smart Object, then hide this layer. Open your Channels panel and click on each of the red, green and blue channels to see which has the most contrast. In this example, I chose the Blue one. 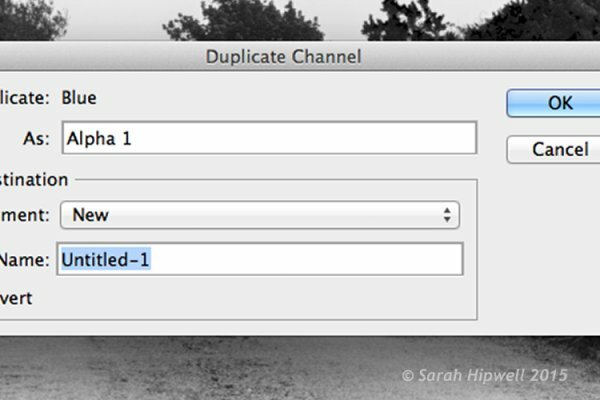 Click and Duplicate this channel. 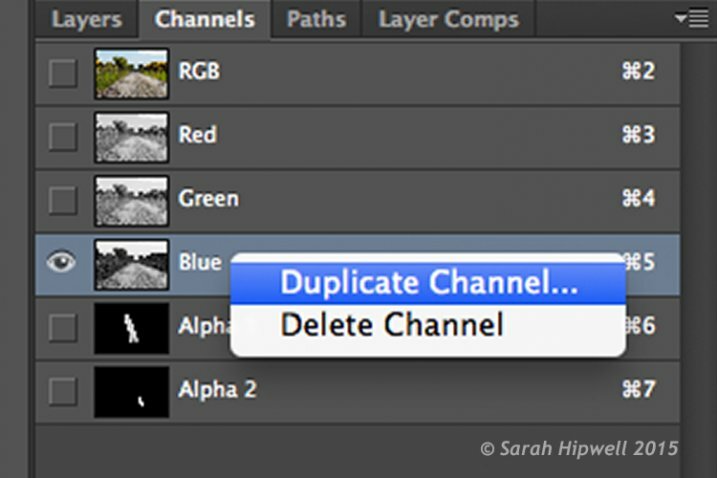 Duplicating the blue channel to create a displacement map. This brings up another dialog box (see below). Where it says Document, click on the tab and choose New. Name this file Displace road or whatever you want and click OK.
Clicking on the Document tab to select New to create a new document for a displacement map. This creates a new document with the layer named Alpha 1. 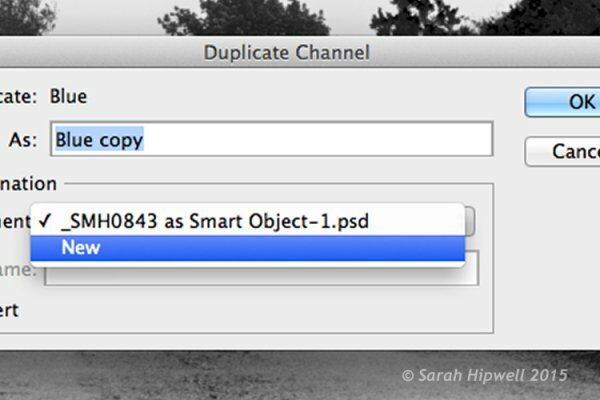 Before you save this document out as a grayscale PSD (Photoshop) file. You need to add some more contrast, go Menu> Image>Adjustments >Levels, then add Gaussian Blur of 9.9 pixels. This will allow the edges of the road marking vector shape to hug the contours of the road, rather than have a jagged edge. Convert this image to Grayscale and save it out as Displace road.psd. Close this document. This dialog box appears directly after selecting New in the previous step. 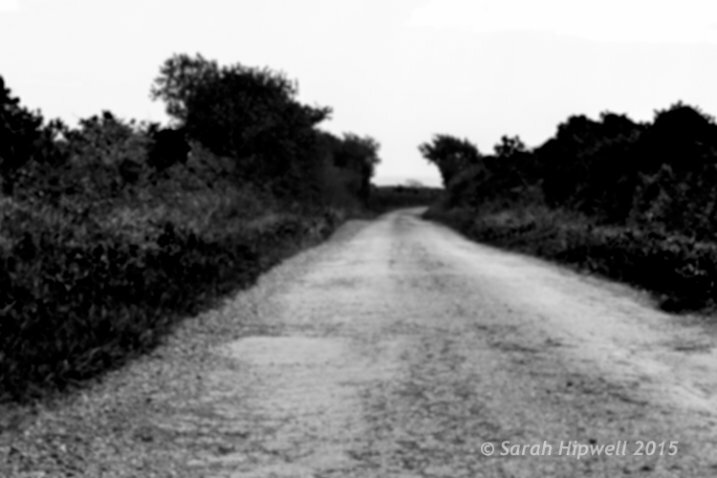 A grayscale displacement map of the road image. Go back to the original document where we are still in the Channels panel and the blue channel is still highlighted. Click on the RGB layer, to bring back the image to colour. 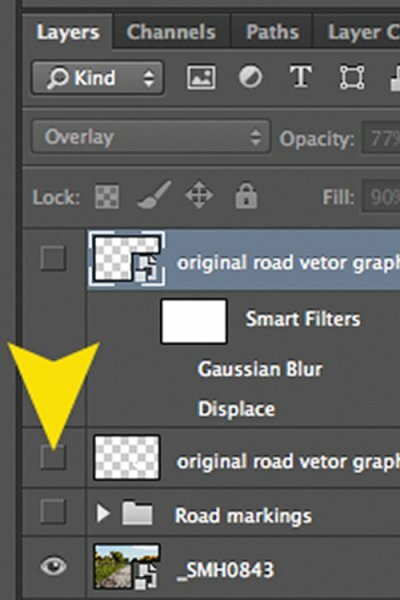 In the Layers Panel (I normally have this nested beside the channels panel) click on the square to the left of the layer thumbnail to bring back the visibility of the road vector shape that I had drawn before making the displacement map. See image below. With this layer highlighted, go up to Menu>Filter>Distort>Displace. A small dialog box appears. The amount of distortion that you apply will depend on the values that you enter in the Horizontal and Vertical scale boxes. It defaults to 10 in each box. These values represent percentages. The higher the values the greater the distortion. Experiment to see the desired effect that you want. When you convert your layers to Smart Objects, any adjustments that you make can be done easily and non-destructively. For this image, I chose 55 in the Horizontal scale and 80 for the Vertical one. I wanted more distortion on the road marking so that it would match the worn look of the road. 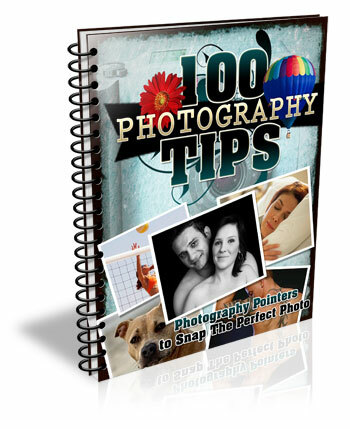 At this point your image may look a bit odd, follow the next step to make it look more blended and realistic. Close-up of the road marking after the displacement map and final tweaks have been applied. Final tweaks: To give the road marking a more realistic look. I added Gaussian Blur of 4px to get rid of the ever so slightly pixelated edge on the shape. Double-click anywhere to the right of the layer to bring up the Layer Style box. I changed the Blend Mode to Overlay, reduced Opacity to 77% and Fill to 90%. In the Blend If section, I moved the black slider to 187 on the Underlying Layer. Tip. If you hold down the Alt/Option key when dragging the black or white sliders, this splits the slider arrow into two which makes the blend more smooth. 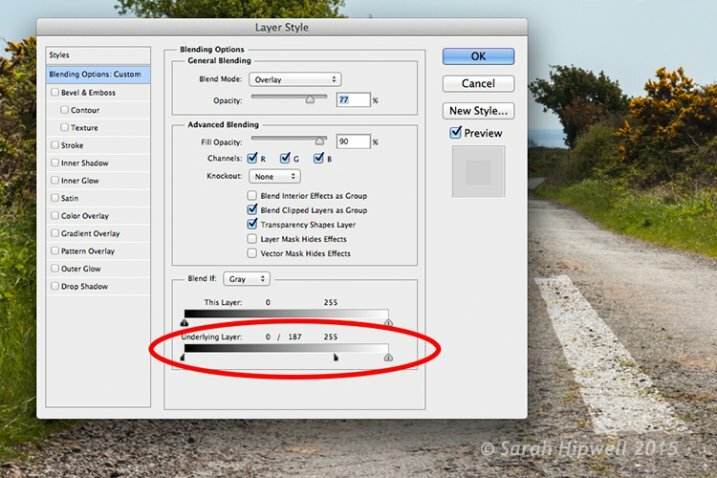 The black slider is split on the Underlying Layer in the Blending Options dialog box. Before and after images showing the distortion on the word “Displace” when a displacement map has been applied. 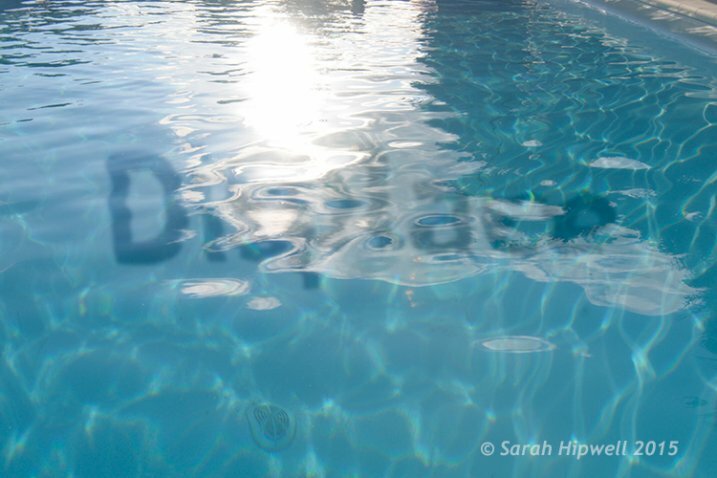 Aim: To create a realistic reflective shadow in water with text. 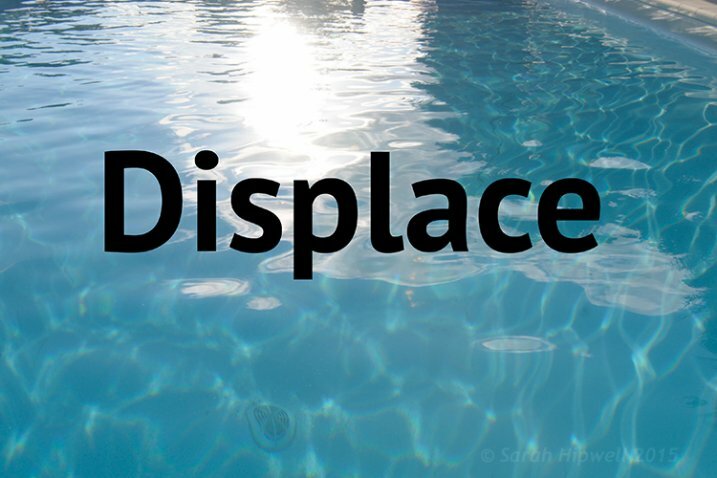 I used the word “Displace” to show how a shadow in water can look quite effective and realistic. The displacement map I made for this image worked really well in distorting the text to wrap around the ripples of the water. I followed the same steps to generate the displacement as above but I applied a Gaussian Blur of 5.4px for this image. The values I added in the Displace dialog box for the Horizontal and Vertical scales were 80 respectively. For the final tweaks, I added Gaussian Blur of 10.1px. 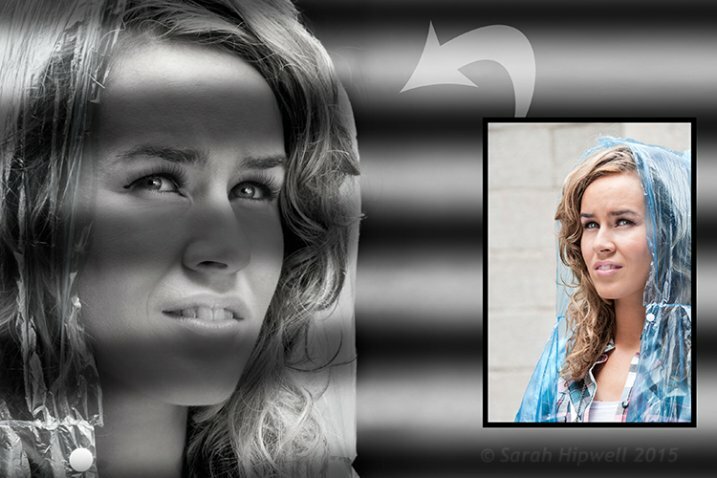 I changed the Blend Mode to Softlight, reduced Opacity to 78%, and Fill to 80%. In the Blend If section, I moved the black slider on the Underlying Layer to 148. 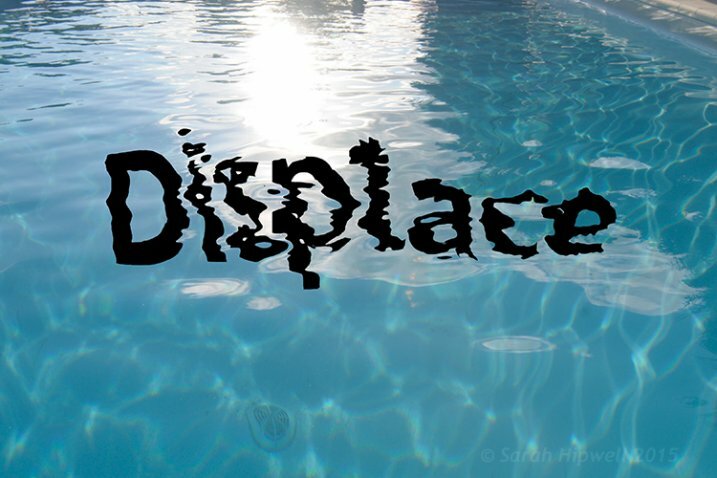 The word Displace distorted using a displacement map. Using black horizontal lines and a displacement map to simulate light shining through window blinds. Aim: To create a film noir look or the effect of light coming through blinds. For this image I had to do more work in Photoshop to get the final look. The process to generate a displacement map is the same here as in the other examples. Just bear in mind that the blue channel is not the best choice for subjects as the skin tones look awful. I isolated the model from this image and put it on a separate layer with a layer mask. 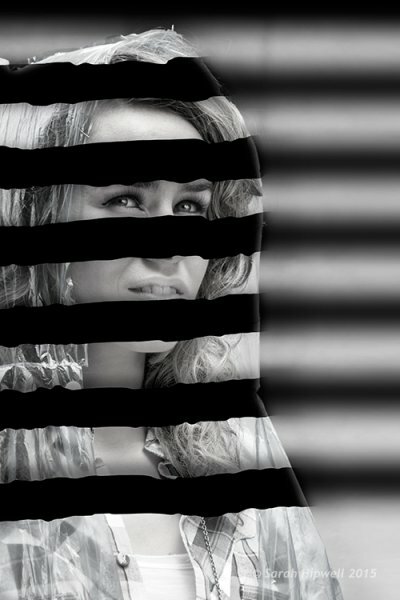 I added a Black and White adjustment layer, then created thick black horizontal lines using the Rectangular Marquee Tool to resemble window slats on a separate layer. Next, I duplicated that layer. I used one for the background layer and added a significant amount of Gaussian Blur. I then moved the other layer above the model with the layer mask. I wanted to angle the black lines (window blinds) across the model’s face. I did this using the Free Transform Tool. Black lines created using the Rectangular Marquee Tool. I made a displacement map and distorted the slats over the model’s face using 15 and 20 as the values for the Horizontal and Vertical scales. The black lines have been distorted via the Displace filter using a displacement map. This is only a brief description of the final tweaks: I applied a Gradient Overlay and some Burning to darken the left side of the model as the light source is coming from that directoin. I added Gaussian Blur of 28.9px and reduced Opacity to 40%. Blue is the worst channel to choose if you are making a displacement map where skin tones are involved. The green channel usually shows the most contrast. Make sure to use Gaussian Blur when generating displacement maps. Displacements maps must be saved out as a grayscale .PSD file. I hope I have inspired you to start making displacement maps and use the Displace Filter if you have never tried it before. The post Get Creative with Displacement Maps in Photoshop by Sarah Hipwell appeared first on Digital Photography School.